She's been a long time coming, but it looks like summer's finally decided to make her debut and a showstopper she is. Long, warm days are shepherding the long-delayed fruits and greens to market, and farmers up and down the valley are heaving a sigh of relief. Contributor Anthony Boutard brings us up to date on the season. The heralds of August, the cicadas (above), started to emerge today with their reedy wing songs. They are also a tasty snack for the acorn woodpeckers and flickers. The birds dart back and forth trying to catch the cicada on the wing, a behavior called "hawking." When we first came here, there were no cicadas, but the same habitat improvements that brought the woodpeckers probably made it a good home for the insects as well. We are in the middle of dressing our field of Chesters (left) for her August harvest. The rows are mowed close to the ground, passing over each twice with the powerful flail mower. Not quite Wimbledon standards, but close. It is slow work, and we will probably finish up after market tomorrow. The careful grooming of the rows makes the field comfortable; removing rough spots and old cane fragments that might trip a tired person. Staff walked the rows checking that the drip irrigation was working well, and that the clips that guide the water to the plants are all in place. They also searched for hornet nests, which we have to burn with a large torch in the early morning. 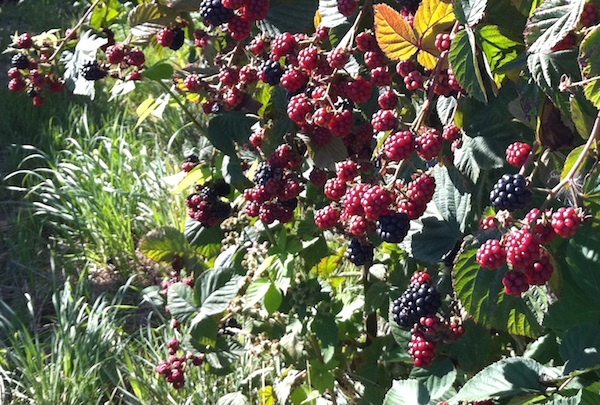 Tolerated elsewhere on the farm, hornets are unwelcome in the berries where staff approach them at face level. The field will receive one last shot of foliar food. It is a witches brew of decaying kelp and nettles, gypsum, a sprinkle of sea salt and fermented fish. The field will challenge the nose for a day so, but at the end 48 hours, no trace of odor remains. By noon, we have acclimated to the aroma, and a tuna fish salad for lunch is our version of the "hair of the dog." We had hoped to apply it Friday morning, but a mere dribble was delivered by the sprayer. So in the cool of the morning when we should be working the fields, out come the spanners and sockets. The sprayer has a pair of innovative controls called hu-valves developed by Hugh Rear of Rear's Manufacturing in Eugene. After ten years, they needed some heat, penetrating oil and a ball peen hammer to free them up. The diaphragms were cracked and will need to be replaced, but a coat of silicone caulk will give them a few more hours of life. By the time everything was bolted down and the valves working, the wind had picked up and it was also too hot to spray. The final step in dressing the field is setting up the pipes for the overhead watering. When the temperature breaks 90°, we have to cool it down during the day. One time early in berry growing we got caught with our proverbial pants down when a 100 amp fuse blew on a Sunday afternoon, and there was no spare. About 40,000 pounds of fruit was destroyed that afternoon, and we are completely neurotic about cooling the fruit. You barely move without find a fuse tucked in here or there. 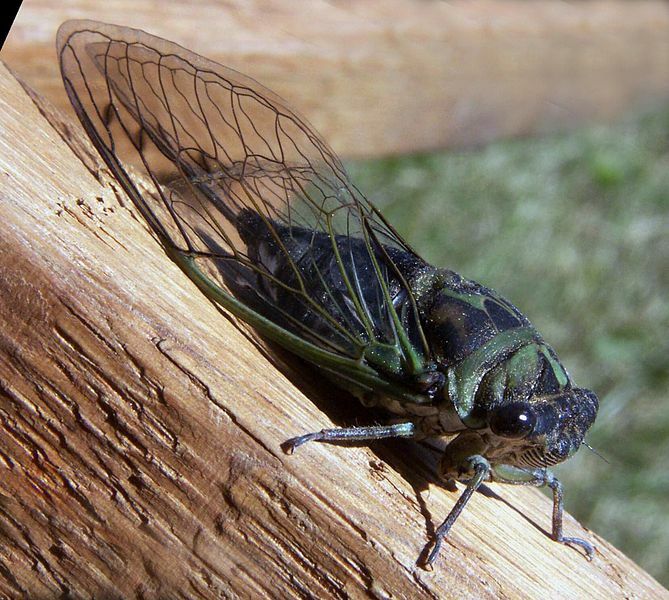 Cicada photo by Bruce Martin from Wikimedia Commons.